For whitewater rafting in the Pacific Northwest, Oregon is the place! The rivers are only short drives from the major cities, and have RV campsites. They provide both novices and experts with a fun and exciting challenge for short half day, one day, and two day trips. If you want a longer, more skilled rafting experience, Oregon also offers some of the best four and five day river trips anywhere! The Umpqua River is, simply put, a dream come true for river rafters! North of Crate Lake, the Umpqua River has impressive Class III and IV rapids. It also flows through some of the most beautiful environment in the Pacific Northwest. The Umpqua has world class pool and drop rapids, with more rapids per mile than any other river in Oregon. The Lower McKenzie River, is perfect for beginning rafters and family adventures. A trip down the Lower MacKenzy usually runs a full day. 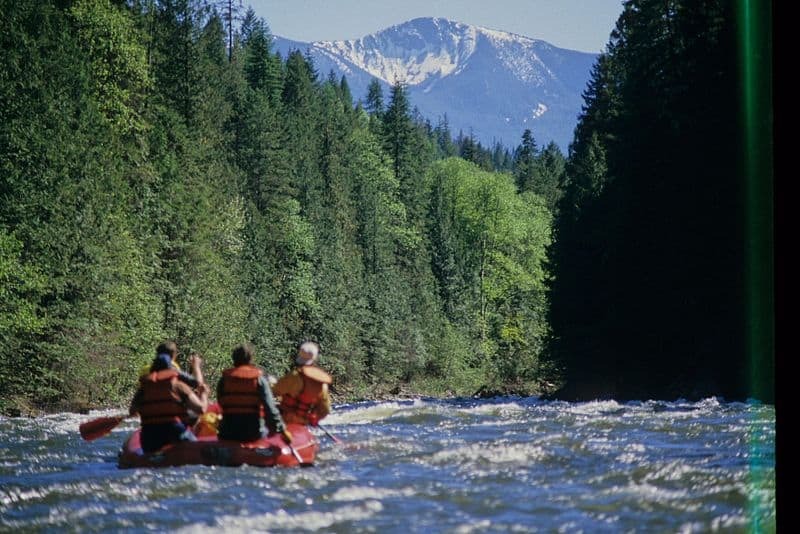 Triver alternates between long, tranquil and relaxing stretches, through beautiful countryside, and with exciting Class II and Class III rapids. The John Day River is great for a multi-day trip. It’s an excellent RV vacation for a for a group, or family that loves the great outdoors. The John Day river provides for many different activities, such as camping and fishing, and excellent long stretches of Class II and Class III rapids. The Rogue River in Oregon is one of the most popular destinations for multi-day rafting trips. Located in southwestern Oregon, the Rogue River transverses the beautiful landscape of the Siskyou Mountains. The Rogue river has more than 80 rapids, with many Class III and a few Class IV for the ultimate white water rafting trip. Oregon’s Deschutes River is one of it’s best known rivers. The Deschutes river crosses rocky mountain vistas, and spectacular desert canyons. The Deschutes has fabulous Class III and Class IV rapids for those eager to try their skill against the river. This river is very popular and, at the height of the season, you’ll never lack for company along the river!